Certificate as awarded to Cafe Nhu Hoa following this nomination. i'd like to nominate cafe nhu hoa, discussed very positively in the threads below, as a GNR. 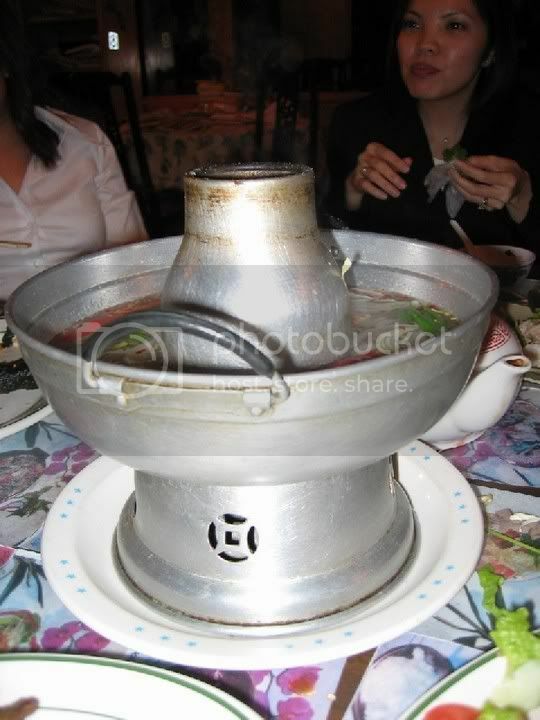 i've been going to nhu hoa for about 10 years or so. i now live very close by and have had more occasion to try other vietnamese restaurants on and around argyle. the only place that came close, imho, to the quality of nhu hoa, was ha mien (since shuttered), on sheridan, and i have been told that it was owned by the same people that own nhu hoa. 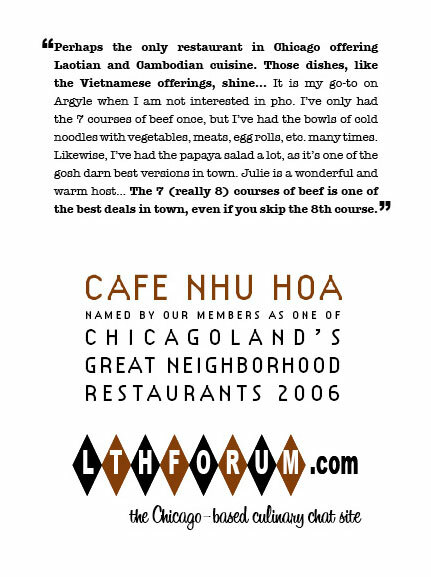 nhu hoa also is perhaps (tho i've not done even an unexhaustive search) the only restaurant in chicago offering laotian and cambodian cuisine. 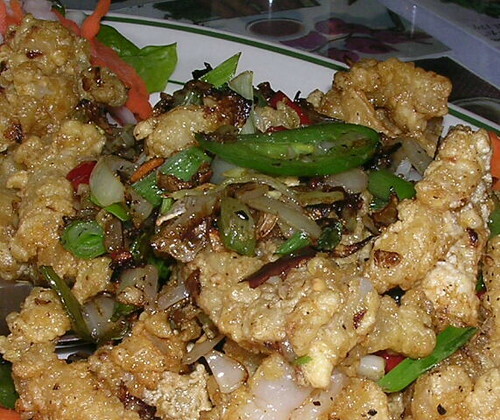 those dishes, like the vietnamese offerings, shine as well. nhu hoa is also a good neighbor. they were one of the first of a still growing number of establishments on argyle taking off the unsightly security bars covering their facades. Okay, as I was looking over the GNR nominees, I have to admit that this one is a mystery to me. It's existed on the periphery of our consciousness for a while, and when it's been mentioned tangentially in a thread on some other place, it's been favorable. It seems as if a fair number of people have tried it. But there's not really a full-fledged thread about it, and only one fairly in-depth post (Vital Info's here.) The most info about it is from the special dinner talked about on Chowhound (linked within one of the threads above), which won raves-- but I'm a little reluctant to award a place based on one specially arranged dinner without some more support for the idea that the everyday menu is pretty special too. So: Cafe Nhu Hoa seems like it ought to be a place we'd give an award to, but help me out. Show me that a few more people think this is a top-notch place (or if you're a dissenting voice, speak up too). Who's been there? What impressed you? Do you, if you've been there, support it for the GNR? I haven't been there in a while (but then I haven't been to anywhere on Argyle for dinner in a fairly long time), but when I do go to Argyle, Nhu Hoa has been my go-to place. Again, I can't comment on specific dishes, but everything I've had has been well-prepared, and others I've taken there have thanked me for introducing it to them, not only for food quality, but also for the extensive menu, which goes well beyond just Vietnamese. I like this place a lot, and it is my go-to on Argyle when I am not interested in pho. I've only had the 8 courses of beef once, but I've had the bowls of cold noodles with vegetables, meats, egg rolls, etc. many times. Likewise, I've had the papaya salad a lot (as it's one of the gosh darn best versions in town, especially when you ask them to make it spicy). Good drinks too. Julie is a wonderful and warm host. Oh, now I see. I have actually been to Nhu Hoa, and found their Laotian rendition of comfort food quite excellent. Before going back thru the threads, I had forgotten. Should go back, so thanks for the reminder. 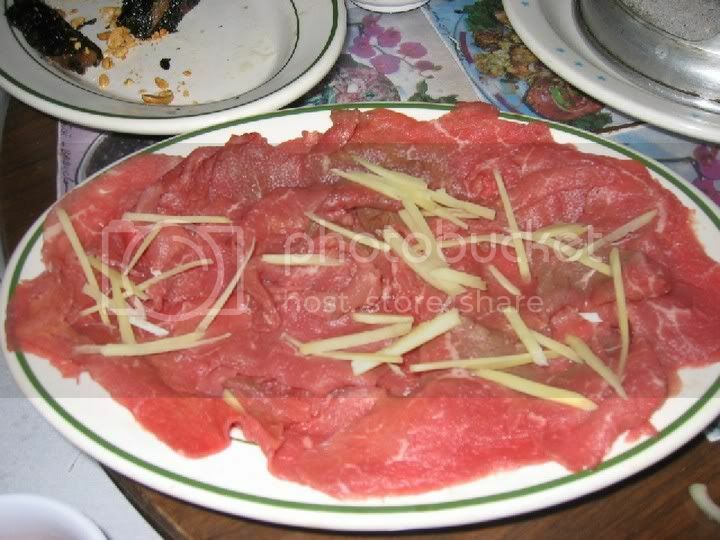 In the time before there was LTHforum.com, there was a substantial board dinner at Nhu Hua where most of us tried ant eggs for the very first time. They also served venison jerky and lots of other interesting foods. While I have only been there 3 times, I've always left favorably impressed and would support this nomination. here's some threads about the regular menu offerings. 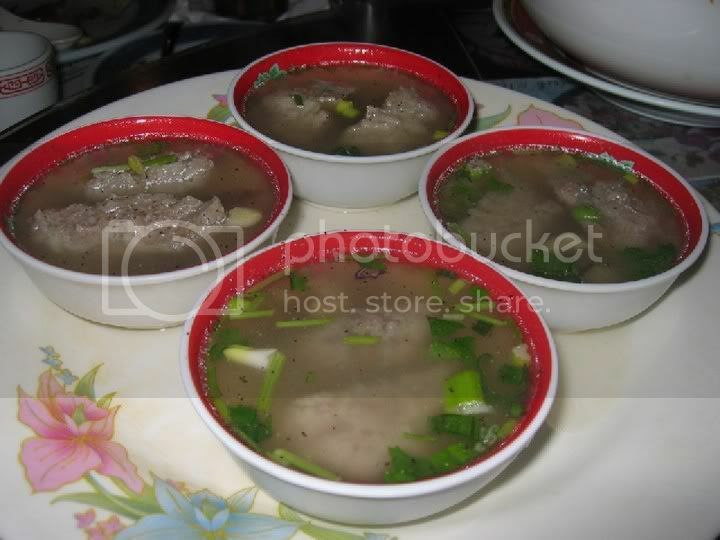 the noodle soups are insufferable as the pho dac biet, bun bo hue and bun xeo all came out tepid and weak. this is the best 7 courses of beef deal in town and on that Tuesday nite, they surely could've used a little internet hoopla. Isn't the 7 course beef meal something like $14 each for a minimum of 2 people? I've long wanted to try it plus the roughly a similar offering except it is all fish over at Pho 777. As much as we all get around, there is always something we have not yet tried. I guess that's what keeps us going.